In December 2013, Joyce Tang (滕麗名) married businessman Matthew Chu (朱建崑) in a private wedding ceremony in Ko Samui of Thailand. Over the past few years, the 41-year-old actress slowed down her work load to spend more time with her family. With less workload, Joyce was more than prepared to answer questions about starting a family. Already at 41, Joyce said she would let nature take its course when it comes to getting pregnancy. Recently, reporters spotted the House of Spirits <一屋老友記> star out and about with her husband in West Kowloon, along with two other elders from their family. Joyce was dressed simply in a white tee and three quarter pants. 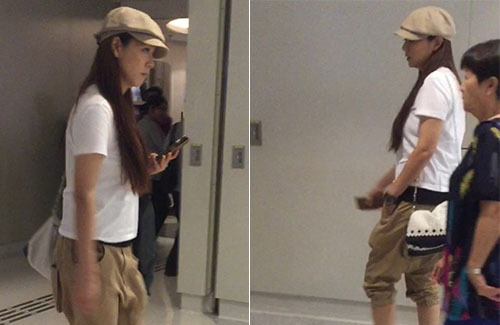 Reporters saw that Joyce, who is usually very fit, was sporting a slight belly bump, leading to speculation that the TVB actress could be pregnant. Her husband Matthew stuck by her side the entire time, and held her hand as they walked through a shopping mall. Wishing her the best as it gets harder the older they get. joyce had gone through rough relationships. she deserves happiness.